Snooza Traveller Pet Bed, perfect for pets and pet owners on the go. 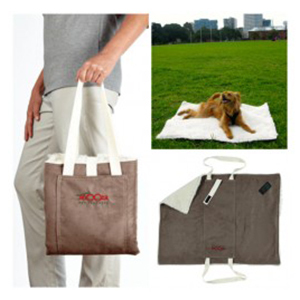 The idea behind this product came from a customer coveting a fellow dog trainer’s mat. As a result, the mat had handles and could be sandwiched in half to enable it to be carried about. Snooza loved the idea but wanted their version to be a bit more multi-purpose. Thus, the mat is padded and reversible with mock suede and also mock lambswool. The deep pocket can hold all sorts of carriables when folded and is a place to hide the handles when flat. It’s easy to fold back up again, lightweight and fully washable. Despite the original brief, in true Snooza fashion, it’s practical and stylish enough for almost any outing. This is another of our products that spent several weeks with their diligent Snooza testers (thanks! ), to make sure it absolutely did what they intended. – Warm machine wash 40c. Do not bleach. Cool tumble dry. Do not iron. Do not dry clean. – Snooza beds perform best when aired regularly.